Cleveland sage (Salvia clevelandii) is not named such because it hails from the much colder clime in the Great Lakes region of the U.S. It was named in honor of Daniel Cleveland, a nineteenth-century lawyer, amateur botanist, plant collector and co-founder of the San Diego Society of Natural History. It is native to southern California, and adjacent Mexico along the coasts below 3000'. This shrub usually grows to about 4 feet tall, sometimes taller, and spreads to about 6 feet. It takes well to pruning (which is suggested after blooming to clean up the spent seed pods). The foliage is very aromatic and used as a substitute for garden sage (we love this sage to cook with, as it has a lot of flavor). Vibrant-purple flowers occur spring through summer, sometimes later and are followed by dried, layered pods. Plants can take full sun to filtered shade, and moderate water (make sure the drainage is good). 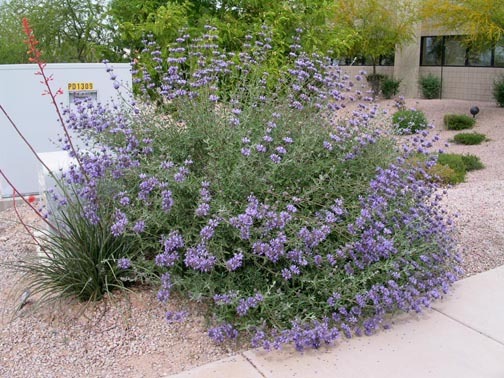 Cleveland sage can take temperatures as low as about 10º F.
This species attracts butterflies, hummingbirds, and are particularly attractive to native bees and considered an important food source to them.